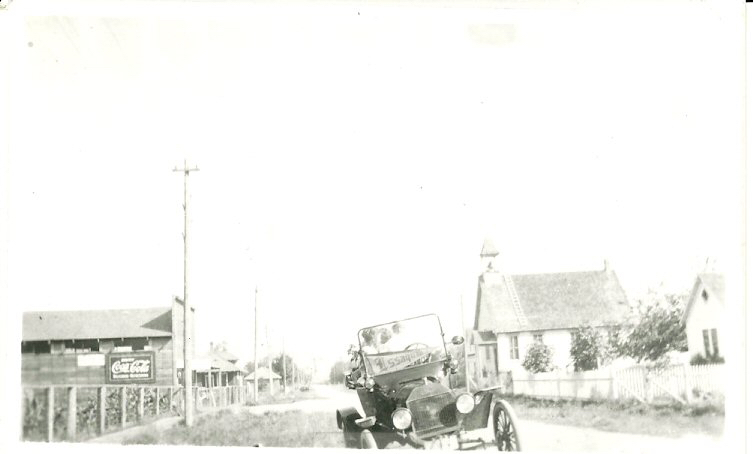 The photographer taking this circa 1915 photograph must be the driver of this early Model T Ford as the car’s driver is missing. The woman and two children in the car are looking back towards Saint Joseph’s Catholic Church which was on the north side of Mill Street (now East Sunset Way mid-block between Third and Fifth avenues northeast). The first Catholic services were held in the Michael Donlan log cabin in 1883. The cabin and Michael’s son’s sawmill was located where the existing Mormon church is now on Sixth Avenue Southeast. Lumber from the sawmill was used to build this building in 1896 as a home for the church. The Coca Cola sign on the building on the left reminds us that about 1915 was when Coca Cola introduced its trademark bottle design still used today.